Presentation given at the Centre for Psychoanalytic Studies 20th Anniversary Conference, University of Essex. 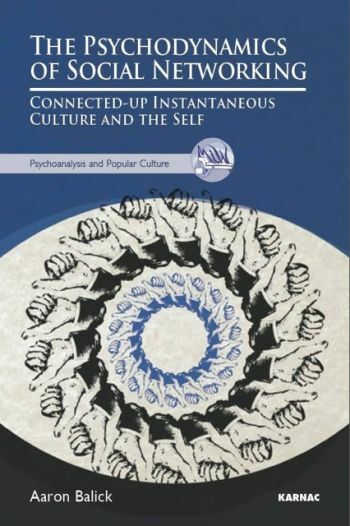 As a former student and member of staff at the Centre for Psychoanalytic Studies (CPS), I was proud to present some basic themes from my new book The Psychodynamics of Social Networking: connected-up instantaneous culture and the self, at the CPS annual conference. From the start of life the human being, both physically and psychically, extends itself out into the world. For the infant, reaching out to its mother’s breast is the physical analogue to the development of object relations and the internalisation of the other. The transition from object relating to object usage, to use Winnicott’s words, entails the movement from relating to the other as object to relating to the other as subject, ultimately advancing to mutual recognition. In many ways, the digital world replicates a transitional space where the challenges and opportunities of object relating, object usage, and mutuality continue. The architecture of the digital world mediates relating in particular ways in league with psychodynamic motivations that invite meaningful psychological and emotional consequences in its users. 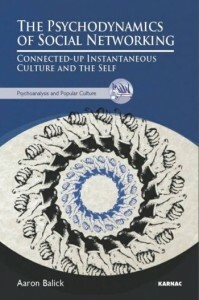 The nature of relational intersubjectivity, as deployed across social networks, invites an economy of recognition in which extended selves are the traders in the relational marketplace. With over a billion of the world’s population on Facebook, the psychodynamic consequences for individuals and our culture are an important locus of psychoanalytic research and analysis. You can access my text-based blog on this subject here.